4 weeks to go guys. With a big early bird entry I hope the weather plays ball. Watch out for mad mike specials which will be posted soon. Remember Orton Events will supply a feed at prize giving ( The famous pork and apple sauce buns cooked by the crew from bradley smokers ) and also for those guys who are staying at nearby camp grounds or houses there will be a courtesy van that will pick you up and drop you off for a small cost of $4 a head just in case you want to have a few beers. Please support our sponsors. Listed Below. Nick (NJ) arrives back in NZ from England in 3 weeks, straight into the comp. I wonder if he still knows how to fish. "there will be a courtesy van that will pick you up and drop you off for a small cost of $4 a head "
Hey milkey you can grab a taxi buddy, those whangarei taxi's a a just as bad as those auckland ones. Can't say I've experienced an Auckland one. Anyway........be good to catch up again and see what turns up at weigh in. And where's these specials MadMike? A few deals for you guys valid from now till the End of the Cove to Cape. Also please note that every time you spend $30 or more in store from now till the Cove to cape you will go in the draw to win an Okuma Cedros Jigging rod and reel combo with braid valued at $799.99. MadMike wrote: A few deals for you guys valid from now till the End of the Cove to Cape. Some Stellar deals there MM ..There's also gonna be one very happy YakFisho or Fishette that walks away with that Okuma Cedros Jigging Combo by spending $30 at TOP CATCH WHANGAREI at prize giving ..
With the diawa sealine reels I hear some people upgrade the drags to carbon washers, how much does this cost and what are the benefits? Douugie wrote: With the diawa sealine reels I hear some people upgrade the drags to carbon washers, how much does this cost and what are the benefits? Wahoo my pass has been granted , now to sort out my booked Accom...should be a perla weekend yakfisho and fishettes ..
Also Orton Events NZ has a new ticket system which has a bar code. This bar code is unique to each individual entry. So when you weigh in your species of fish, your ticket will be scanned and all your information will show up on screen for you to see. It will also give you a receipt for each day's weigh in. So don't loose your tickets. An 18.5kg kingie from down the coast, now with the Russell Smokehouse for treatment. Wheres all the Kings PJ I'm sure a lot yakkers would like to know. A big thanks to Michelle from Bradley's and Char-broil who will be at Top Catch Whangarei on the Saturday weigh-in with Smoke Chicken wrap in bacon for you yakkers to have a feed. She also will be doing the famous pork buns on Sunday. Orty wrote: Wheres all the Kings PJ I'm sure a lot yakkers would like to know. That sounds absolutely yummy ! For a whole lot of different reasons , mostly work , weather , life ect ect I have had my longest time off the water in 6 years of kayak fishing . 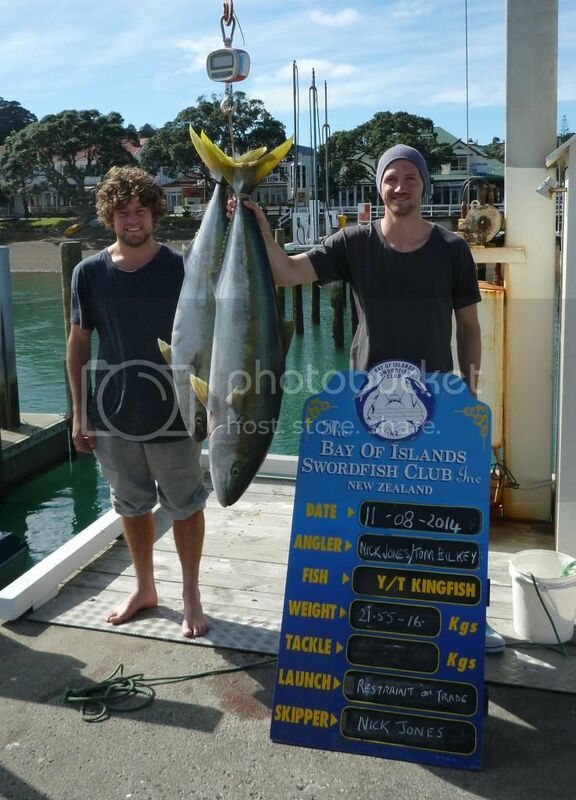 In fact I haven't been out fishing since the Auckland Comp , not like me at all but that's life ! So looking forward to catching up with my yak fishing bros if nothing else ! He's out at Cape Brett today (a loooong paddle for someone who had reconstructive surgery on his left shoulder only 2 months ago, so just as well he and his mate went out on the Stabi), and already landed an est. 22kg kingie; just phoned me to arrange weighing at the Swordfish Club.